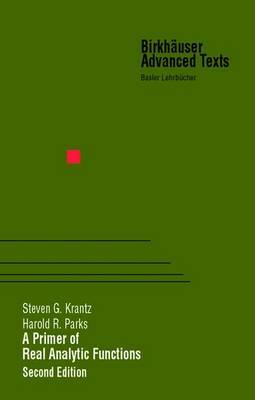 Key topics in the theory of real analytic functions are covered in this text,and are rather difficult to pry out of the mathematics literature. ; This expanded and updated 2nd ed. will be published out of Boston in Birkhauser Adavaned Texts series. ; Many historical remarks, examples, references and an excellent index should encourage the reader study this valuable and exciting theory. ; Superior advanced textbook or monograph for a graduate course or seminars on real analytic functions. ; New to the second edition a revised and comprehensive treatment of the Faa de Bruno formula, topologies on the space of real analytic functions,; alternative characterizations of real analytic functions, surjectivity of partial differential operators, And the Weierstrass preparation theorem. "This is the second, improved edition of the only existing monograph devoted to real-analytic functions, whose theory is rightly considered in the preface 'the wellspring of mathematical analysis.' Organized in six parts, [with] a very rich bibliography and an index, this book is both a map of the subject and its history. Proceeding from the most elementary to the most advanced aspects, it is useful for both beginners and advanced researchers. Names such as Cauchy-Kowalewsky (Kovalevskaya), Weierstrass, Borel, Hadamard, Puiseux, Pringsheim, Besicovitch, Bernstein, Denjoy-Carleman, Paley-Wiener, Whitney, Gevrey, Lojasiewicz, Grauert and many others are involved either by their results or by their concepts." "Bringing together results scattered in various journals or books and presenting them in a clear and systematic manner, the book is of interest first of all for analysts, but also for applied mathematicians and researchers in real algebraic geometry."